Not being much of a romance fan, the idea of reviewing a romantic movie was troubling to me. But this is Joe Movie, and no film genre will be left behind. Directed by Marc Webb, "(500) Days of Summer" is a typical love story, but it is shown in a quirky way that is as entertaining as it is unique. 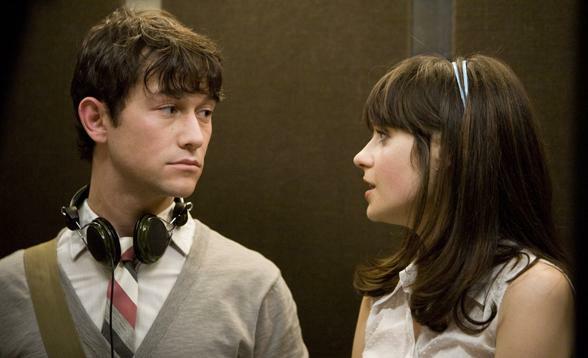 After falling head over heels in love with Summer (Zooey Deschanel) and subsequently having his heart shattered to pieces, "(500) Days of Summer" takes us on a journey as heartbroken Tom (Joseph Gordon-Levitt) tries to figure out how he lost "the one." The two main characters of "(500) Days of Summer" each represent opposing viewpoints on true love. While Summer believes love is a myth, Tom is a firm believer of it. This film is a storybook-esque tale of the difficulties of a relationship and the hardships of overcoming a breakup, with the narrator even warning us in the beginning: "This is not a love story." "(500) Days of Summer" offers much more than is to be expected from a romantic film nowadays. Tom isn't your typical leading male with long hair, big muscles, and a mean attitude; he is an innocent, confused greeting card writer looking for love. Even Summer is an uncommon love interest, with a twisted sense of humor and unique style. Then, there's the acting: Levitt and Deschanel is an acting combo to be reckoned with. Levitt drags you into the depression after a breakup, and Deschanel leaves you wishing she never dumped poor Tom. I found myself just as caught off guard and confused as Tom when Summer abruptly breaks it off. I found myself consumed in the re-telling of their relationship, looking for the mistakes Tom may have made that led to the breakup. "(500) Days of Summer" is edited in a very peculiar way, unlike any romance film I have ever seen. The transformation of Tom's relationship with Summer is shown through glimpses into particular days of their relationship, jumping from various days of the 500 day-long affair, giving "(500) Days of Summer" a characteristic storybook feel. Director Webb utilizes a multitude of exciting visual effects throughout the film. As Tom and Summer's relationship evolves, the environment is manipulated to match Toms constantly changing perspective on true love. The film jumps from Tom producing increasingly morose greeting cards following the breakup to an earlier day; Tom breaking out into song after a successful first date, cartoon birds join him and the colors of the city become more vibrant as he dances along the street with backup singers. Which brings me to one of the best aspects of "(500) Days of Summer:" the music. The soundtrack for "(500) Days of Summer" is wonderful. With tracks from great artists such as The Smiths, Wolfmother, Simon & Garfunkel, and Hall & Oats, the soundtrack is jam-packed with indie rock beats that carry the story incredibly well. Immediately following the end of the movie, the first thing I did was find the soundtrack online. Just listening to some of the featured songs from The Smiths has me smirking, reminding me of the film. While "(500) Days of Summer" is a very simple love story, it dares to take a path very few romance films do, breaking away from the usual "Boy meets girl, boy looses girl, boy tries to get girl back" formula. It is an inspiring and comforting film for anyone who has fallen in love and lost "the one." - Unique cinematography, very entertaining. - Phenomenal acting by both Levitt and Deschanel. - If you*re looking for your typical lovey-dovey film, you may be let down.